In his debut cookbook, Jennings honours the traditional foods of New England while turning them on their head - maple flavours the dressing of a Little Gem lettuce salad as well as the dipping sauce for dumplings, molasses and cider are used to marinate chicken wings, a blueberry sauce accompanies a roasted lamb dish, and Moxie (the official soft drink of Maine) flavours beans and short ribs. New England favourites updated Jennings's way - pot roast dinner, clam rolls, lobster rolls, brown bread, frappes, and Boston cream whoopie pies - accompany long-form stories about putting together the perfect cheese board, cooking in the shoulder season, the rules for making tartare at home, how to throw an old fashioned ice cream social, and more. Jennings celebrates the ingredients, geography, climate, history, and traditions of this region. "Spills and stains are to be expected on this lushly photographed compendium . . . its pages shot through with clever ideas." "Unlike some chef-written books, which are filled with complicated recipes and subrecipes, the ones I tried from Homegrown were easy to follow and a breeze to prepare. They were also delicious. . . . Clearly with some of these recipes, Jennings ventures beyond his New England roots, yet somehow stays firmly grounded in them, a delicate balance he pulls off with panache throughout this delightful book." "[An] illuminating, gotta-have resource. . . . A gifted storyteller, Jennings uses his Northeastern heritage as a prism, sharing the beauty and bounty of this historic, tradition-laden region through 100 practical, easy-to-follow recipes that resonate far beyond the borders of Maine, Vermont, New Hampshire, Massachusetts, Rhode Island and Connecticut." "Inventive. . . . [Homegrown is] a fun read, a chatty book that demonstrates serious regional love." "Homegrown, I'm happy to say, is not a chef-y, showoff-y, navel-gazing bore filled with recipes a home cook will never bother to tackle. I'm done with those. It is a deeply personal tribute by a man who feels the salt and iron of the region coursing through his very blood. There's honesty and design in the way he organizes chapters in an elemental way: Dairy, Ocean, Farm, Garden and Orchard, Forest. . . . This one's a stunner. Boy's got something to say." "A treasury of ingenious takes on New England and American classics. . . . Gorgeous, flavorful dishes. . . . Jennings's exciting recipes will inspire readers to get more creative with their cooking." "Never has there been a better time for New England cuisine, and anyone who's dined at the award-winning Townsman in Boston knows that Jennings is to thank. [Homegrown shows you how to] recreate his twists on centuries-old classics by using seaweed to boost the brininess of clam chowder or adding Yankee flair to carbonara via razor clams and salt pork." "A loving exploration of the dishes, landscapes, and ingredients of the region, it is filled with recipes that are personal while pushing the envelope of local cuisine." "Filled with little touches that'll have you reconsidering New England classics. . . . More importantly, though, this book is a reminder to mine your own heritage and your own memories when crafting a dish or planning a menu, wherever you are." "[One of] the 7 Most Anticipated Cookbooks of Fall 2017." "This book echoes the simplicity and delight of mealtime with Matt's wife and their boys rather than the foods that require a restaurant kitchen and larder. Homegrown will make your kitchen a better place to cook in and a better place to eat in and will supply you with a lifetime of great recipes that your family will love." "Matt's book tells us a compelling personal story about the place that defines him. His respect for these ingredients and his delicious recipes will forever transform your understanding of New England flavors." "The recipes Matt gives us in Homegrown honor not only the food of his heritage but also the food of his heart. As a dad, Matt realizes that what we cook at home must be both simple to make and worth the effort. These dishes will soon become favorites in your house, too." "A great debut for Matt Jennings! His New England background and his love for food make this a great read as well as an amazing reference for anyone looking to amp up their kitchens. The recipes are simple enough for a home cook to follow with professional results." "With a title like Homegrown, who could resist? 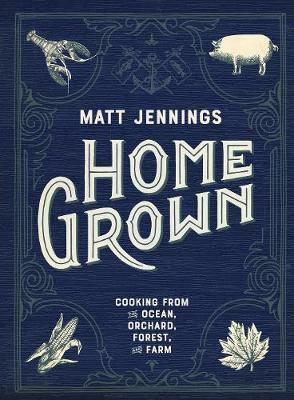 This book is an inspired compilation of the food Matt Jennings has grown up with. From his soul to your table, these dishes will take you right to New England and all the delectable seasonal provisions it offers." "This is new, quintessential New England cuisine brought to you in a book full of insight and delicious, smart food."